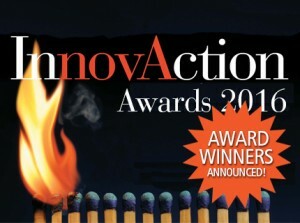 Congratulations to the winners of the coveted 2016 InnovAction Award, Ogletree, Deakins, Nash, Smoak & Stewart, P.C. and Norton Rose Fulbright Canada LLP. The awards were presented Friday, September 16, 2016, at a special lunch session during the 2016 Futures Conference, held in conjunction with the Annual Meeting of the College of Law Practice Management. Ogletree Deakins Advantage — Ogletree, Deakins, Nash, Smoak & Stewart, P.C. Key Team Members: Charles Baldwin, Brian McDermott and the Knowledge Management Dept. Ogletree Deakins Advantage is an innovative service delivery model that leverages technology to streamline the handling of day-to-day legal issues. This goal is achieved by examining employment related processes, including analysis of a client’s past litigation and claims, to identify problematic areas. Ogletree then implements a corrective plan that includes using proprietary tools to improve these processes. Introduction of these improvements results in increased predictability and control of legal costs, consistent application of employment policies, faster resolution of legal issues, and an overall reduction in the number of claims for clients. Throughout the engagement, a dedicated Ogletree LPM analyst coordinates the relationship, maintaining responsibility for plans and budgets, status reports, status meetings and an annual review. Ogletree Deakins Advantage uses its proprietary technology to enhance knowledge management capabilities and increase legal project management efficiencies. The included technology promotes communication between the client’s legal and HR teams and Ogletree Deakins attorneys, and enables managers to be proactive in responding to legal issues before they become costly legal claims. How can we make life easier for in-house counsel? Here’s how. Norton Rose Fulbright LLP makes life easier for in-house counsel by developing state-of-the-art client innovation portals focused on delivering innovative, customized and meaningful solutions to everyday problems. These solutions range from streamlined access to matter and financial documents, to the automation of business and legal processes by developing applications and expert systems to create efficiencies, increase productivity and mitigate risk. Our platform allows legal departments to conduct more efficient due diligence data analysis, to provide electronic compliance training to their personnel and business partners, and to gain better visibility into legal fees on an ongoing basis. This is how Norton Rose Fulbright LLP makes life easier for in-house counsel. The 2016 InnovAction Awards are sponsored at the Platinum level by Right Hat. Gold level sponsors are: Affinity Consulting Group; Association of Legal Administrators (ALA); Attorney at Work; Gensler; International Legal Technology Association (ILTA); Legal Marketing Association (LMA); Mattern & Associates, Ltd.; Ricoh; and Sensei Enterprises Inc. Silver level sponsors are: ABA Law Practice Division; Altman Weil, Inc.; Bloomberg Law; Elevate; LawPay; and Neota Logic. Click here for more information on our sponsors. For the 2016 Winners Media Release, click here.